Nicky’s Recipe for October & to celebrate World Food Day!! On Tuesday, we celebrated World Food Day. This is observed on the 16th of October every year and is dedicated to tackling and making people aware of the problem of hunger. Sadly this still exists today in many countries and according to the Food and Agriculture Organisation (FAO) has been increasing since 2014. Halve, deseed and peel the pumpkin. Then cut into chunks about 2.5cm square. Put these into a steamer and cook over boiling water for about 15 minutes. Slit the chillies lengthwise (you can decide whether to remove the seeds or not (Diana doesn’t) and chop. Remove the tougher outer leaves of the lemon grass and roughly chop the paler hearts. Put the chillies, lemon grass, garlic and ginger into a small food processor (or a pestle and mortar) and whizz until you have a paste. If you’re using a food processor you might need to add a little oil to help it blend. Add the coriander stalks and half the leaves, both chopped, and the lime zest and blitz again. Add the pumpkin, chicken and spinach to the laksa and allow the chicken and pumpkin to warm through thoroughly and the spinach to wilt. Finally stir in the rest of the coriander leaves, the mint and the lime juice. Taste for seasoning. 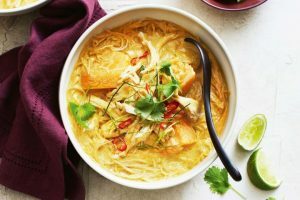 Divide the noodles between four bowls and ladle the laksa on top.